This script allows you to use Terrain Tags to easily make Characters move diagonally on Stairs. It is useful with some styles of Tilesets where the stairs require Diagonal movement. It also allows NPC Events to interact with any and all Stairs as well, which is why this is far superior to any other solutions. # Definition: NPC - Non Player Character, an Event with a Character Graphic. # far superior to any other solutions. # Oh yeah, and I wrote it, thats why! # Just edit your Tileset and flag any Diagonal Stairs with a Terrain Tag. # are two Terrain Tags for you to use. # Note: ONLY Left and Right Movement Commands are affected by Stairs! # movement on Stair Tiles. These NPCs can still be "Forced". # \use_stairs - This NPC will ALWAYS use Stairs, regardless of other settings. # \no_stairs - This NPC will NEVER use Stairs, regardless of other settings. # \no_event_tiles - This NPC will NEVER try to move on Events with Tiles. # NOTE: You'll see me use \no_event_tiles in several other scripts. # the adjacent tiles because that prohibited any form of Narrow Stairs. # mind when setting up your Passage Settings for your tilesets. # is not guaranteed for more exotic scripts like Pixel Movement. # Heretic's Caterpillar has been updated to Version 1.99.6 for compatability. # This script probably wont be compatible with any Pixel Movement Scripts. # Pathfinding over Stair Tiles will most likely be problematic at best. # This script probably wont be needed by any 8 directional movement scripts. # just completely superfluous however. # configured in the Databse. # I feel very strongly about Tilesets that do not have Database Configurations. # You may post this script on any website. # as long as I am credited somewhere in the project. # You may package this script. # You may NOT claim this script to be your own property. # from the Players position while they stand on Stairs. # only Front Triggering occurs, which is default. # Terrain Tiles that have Stair Terrain Tags. I'd like to thank Hotpockets for being so tasty! There are Two Versions of this script: Lite and Deluxe. This is the Deluxe Version. It requires Modular Passable to work. 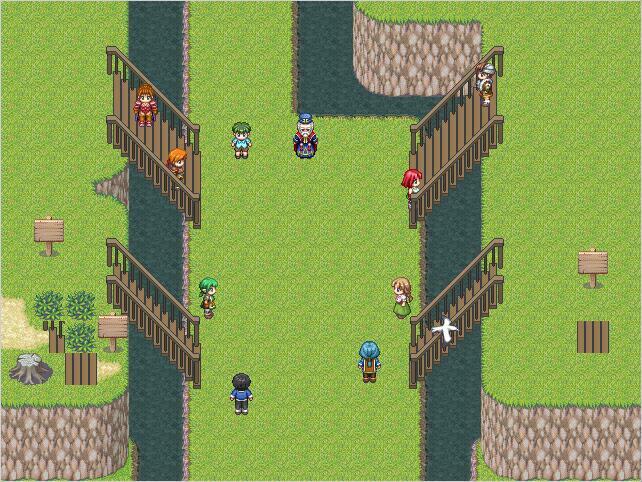 This version will allow you to make Stairs out of Events, and to have NPCs move on Event Stairs with no extra effort.